So in case you couldn't tell, the hair has been CHOPPED! Over the last year and a half, I've been growing my hair to donate. I finally made the cut and let me tell ya...it's a welcome change. I love how my hat even looks different with my new hair. Wooo hoooo! Your hair looks too cute! Good for you! Having short and easy to manage hair is the best for pregnancy! C u t e ! I have long hair envy, but ugh .. don't think I could deal with long locks. OMG! I LOVE IT! I hardly even recognized you! So gorgeous!!!! Love your new hair!! So pretty!! The new cut looks great, I love it! Looks fab! and will be so much easier when baby arrives. So wonderful that you donated it. your haircut is gorgeous! 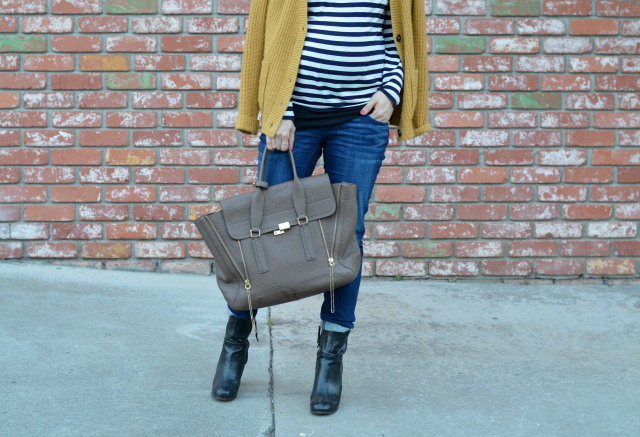 I love the colors you styled in this look, especially your sweater! I LOVE your haircut!! So fabulously chic!!! Your hair looks AWESOME!! I love that you grew your hair out with the goal of donation. Must feel amazing to donate to such a great cause and to have such a dramatic new look. I love your new do!!! And how awesome to be able to donate your hair to such a worthy cause. The new hairstyle looks supercool! I love this outfit! 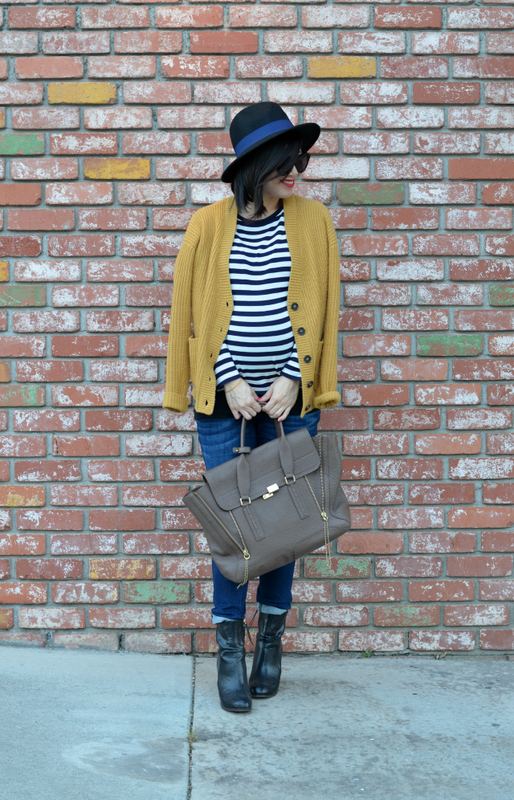 The mustard sweater is so cute! That hairstyle suits you perfectly! And this look is one of the chicest things; I pretty much love every garment and accessory and how you styled the whole thing :) Really nice. I love the new Chopped do'! 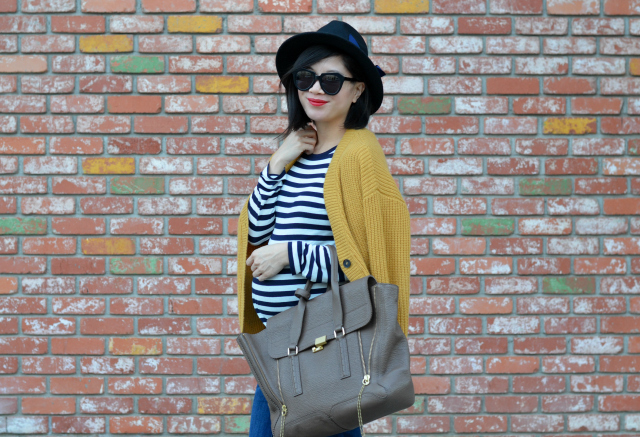 You are looking great with your "bump" style! 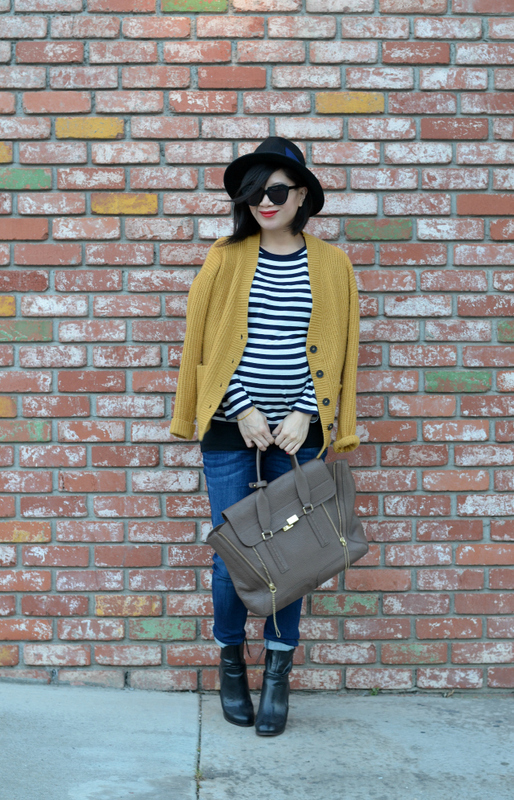 I love the hat with the booties, so chic! Your hair looks amazing! I love this length. And I love the pop of blue on the band of your hat! LOVE it! Clearly I am a fan of the LOB, but it looks amazing on you! This outfit is killer. I want to go home and recreate it myself. I keep seeing people wear boots with boyfriend jeans and look awesome but every time I try I look like a total poser. it looks great! and such a lovely cause! Looks so good! I love the length and style. Fab outfit and hat.